Around 1 billion people worldwide do not have access to electricity, with a majority living in rural areas. Given that electricity is essential for economic development, education, health and poverty alleviation, efforts to expand access around the world are critical. Yet simply extending the electricity grid is not always the most physically or economically viable way to increase access, especially in remote rural areas. From mountain villages in Afghanistan and Bhutan to settlements perched on steep slopes in Nepal, small-scale solar and hydropower are bringing electricity to more and more communities. These local renewable energy technologies, called “off-grid” systems because they are not connected to a central electricity grid, are particularly successful at reaching remote communities. 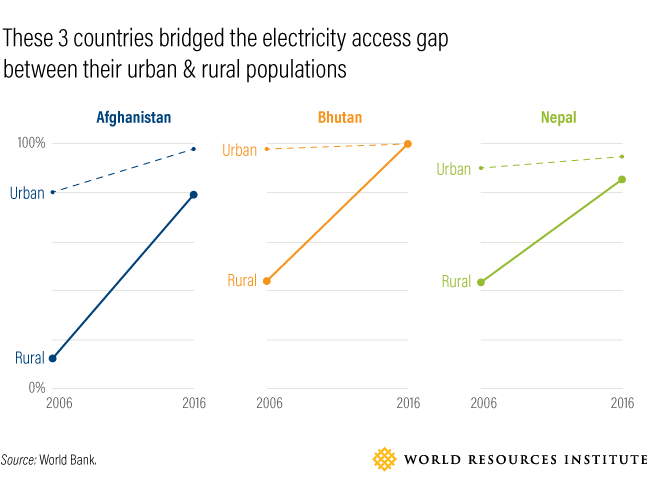 According to the World Bank, Afghanistan, Nepal and Bhutan are the three countries with the greatest increases in national electricity access rates from 2006 to 2016. 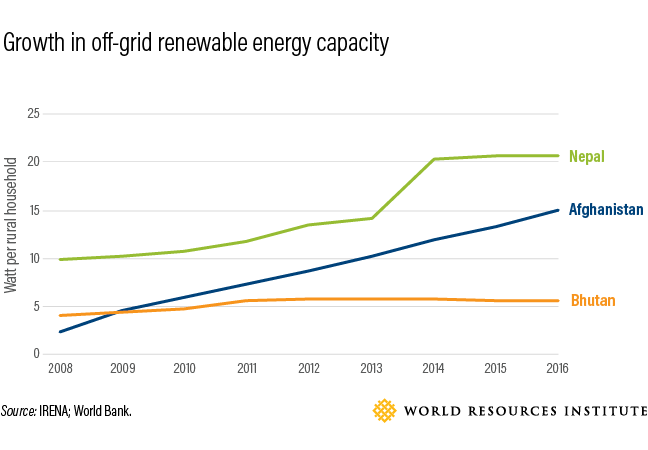 While grid-connected renewables have played a major role in increasing access in these three countries, off-grid renewables have been pivotal in electrifying rural remote areas where grid extension is not feasible. Between 2006 and 2016, the percentage of Afghanistan’s population with access to electricity went up from just 28 percent to 84 percent. While the majority of the population now has electricity, only a third of it uses the national electric grid, with the rest relying on off-grid systems. After years of non-existent rural electrification plans and a civil war that split the country into regional grids, the government established the National Solidarity Program (NSP) in 2002, meant to provide access to basic services in Afghan villages. The NSP played a major role in improving remote villages’ access to electricity through renewable energy sources, which are abundant in the country. This involved installing more than 5,000 micro hydropower plants that produce up to 100 kilowatts (kW) of electricity and implementing 2,450 solar projects, including rooftop solar panels and solar water heaters and pumps. Part of the NSP’s mission was to encourage local community ownership of development projects; as a result, the installed mini-grids are largely community-owned and managed. However, access to finance is a challenge for developing any new projects in Afghanistan. Specifically, the limited availability of risk guarantees, micro-credit programs and low-cost loans makes it difficult for many households and small businesses to finance renewable energy projects. Those who do not have savings, family funds or other informal sources of finance often have difficulty undertaking such an investment, which can amount to anywhere from $400 to $20,000. Rivers and streams are common in the mountains of Nepal, but access to the national electric grid is not. With more than 6,000 rivers and tributaries and 300 days of sunshine a year, Nepal has been driving rural electrification through off-grid renewables, specifically with small-scale hydropower and solar home systems. With 81 percent of the population living in rural areas, off-grid solutions are an important part of the national strategy for increasing electricity access. A government body called the Alternative Energy Promotion Centre (AEPC), formed in 1996, promotes off-grid renewables by offering subsidies, support for agricultural and commercial activities produced with renewables, and technical assistance to ensure the quality of renewable systems and to monitor their performance. As a result, around 2,000 hydropower mini-grids with a combined capacity of around 30 megawatts (MW) have been installed since 1996, providing electricity to 1.5 million people. In 2006, the country adopted a landmark Rural Energy Policy, giving local governments a mandate to promote renewable energy technologies in their efforts to expand rural electrification. Thanks to these efforts, Nepal’s electricity access rate has increased from 51.2 percent in 2006 to 90.7 percent as of 2016. One emerging challenge for Nepal is encroachment by the national grid, which delivers electricity generated mainly from biomass, into areas already served by community-owned mini-grids. In order to protect existing solar and hydropower projects, AEPC and the Nepal Electricity Authority, the national grid operator, need to coordinate and create policies that allow mini-grids to connect to the central grid, without becoming redundant. Bhutan’s electricity access rate has increased from 61 percent in 2006 to 100 percent in 2016, ahead of the country’s initial 2020 goal. On-grid hydropower is Bhutan’s main energy source and the main driver behind its rapid expansion of electricity access. Yet, the country’s mountainous terrain makes grid extension difficult in the remote rural areas where around 4,000 households are located. As a result, the government has made off-grid renewable energy projects a major development effort under the nation’s five-year plans, providing around 2,000 rural households with solar home systems and repairing an additional 1,000. Similar donor-assisted grant projects have filled the rest of the country’s electricity gap. Although the government of Bhutan achieved the remarkable feat of 100 percent electricity access, it lacks the resources and manpower to sustain these projects on its own. The country’s mountainous terrain makes remote areas difficult for government workers to access. Communities will ultimately need training to install and repair systems themselves, a strategy that would also lead to more jobs in remote, off-grid areas. A few pilot community-based projects exist, but Bhutan’s remote rural areas need more. Afghanistan, Nepal and Bhutan are excellent examples of how renewable energy potential combined with government support can result in successful electricity solutions. While they still face some financial, regulatory and technical challenges to long-term sustainability, their approaches so far can serve as models for other countries. Countries with high elevation and mountainous terrain, such as Rwanda, Burundi, Lesotho, Peru and Mongolia, are all places where off-grid renewables could be a more viable way of improving energy access than extending the electricity grid. Learn more about WRI's Energy Access work here.